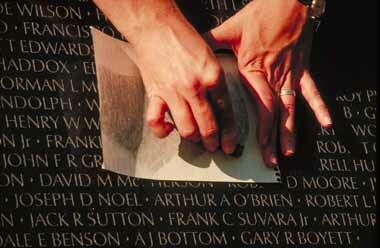 given the assignment for her black marble wall with the name of each serviceman who died during the Vietnam War. 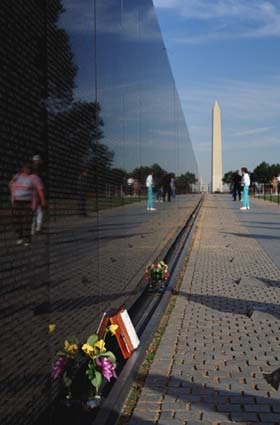 Lin's design was a black granite angled wall with the names of all the veterans who died in Vietnam. Many historical and veterans groups protested the unorthodox design and wanted to add a more traditional statue and an American Flag. Proponents of Lin's design in turn opposed emplacing any sculptures. burial. One end of the Wall points toward the Washington Monument and the other points at the Lincoln Memorial. One-hundred-and-forty concrete pylons were sunk 35 feet into the ground to support the Wall. Each side of the Wall rises from the ground to a height of 10 feet in the center. original military enlistment. A Park Service Ranger will be on hand at the memorial to assist family and friends. 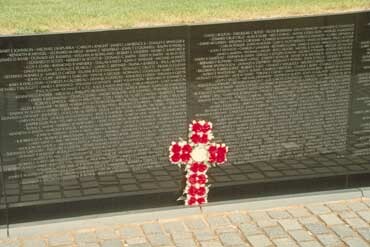 At the Wall, copies of the Vietnam Veterans Memorial Directory of Names are positioned at each end of the Wall. 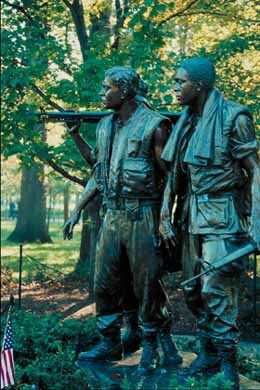 For on-line help in finding a name, visit www.vvmf.org for the Vietnam Veterans Memorial Fund web site. can also park at the Washington Monument and the Jefferson Memorial. For more information about the Vietnam Veterans Memorial, call 202-426-6841.